Content marketing can be incredibly effective at strengthening your brand, but it is not a promotional tool. 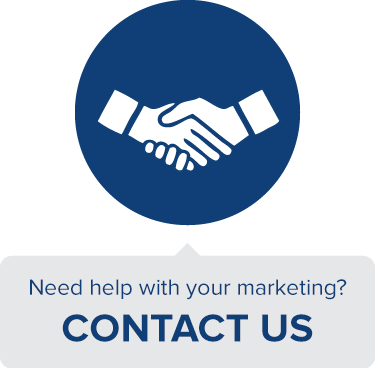 Simply blasting out promotional messaging will not drive sales, rather it will alienate your customers and waste your valuable time, effort and resources. To fully realize your content marketing’s potential, remove sales from the equation and instead deliver value. Making a promise of value that aligns with your brand’s strengths will help you earn the right to sell to your customers and will make the audience for these messages both larger and more receptive than they ever would have been through promotion alone. Enjoy the SlideShare version of this article. In the recent book by Guy Kawasaki and Peg Fitzpatrick, The Art of Social Media, they illustrate the necessity for earning the right to promote by using NPR as an example. The main idea behind this analogy is that roughly 99% of all messaging released by NPR is high quality content, released for free, with no ulterior motive. The cumulative effect of the good will this builds surrounding their brand is that once or twice a year, NPR fans are more than happy to respond generously to a pledge drive. Now, NPR happens to have a very particular place in the economy and a structure that favors this extreme altruism, but no matter what the financial pressures are on your brand you can take a page from NPR in terms of not being overly promotional. This marketing principle is not new though. Fifteen years ago, in his classic book Permission Marketing, Seth Godin formulated a very similar idea. As I’ve written about before, Godin asserts that you must get explicit permission to market to your customers and that the marketing messages you do send must be anticipated, personal and relevant. So how do you get consumers to opt in to receiving your marketing? Strictly promotional material is not likely to be all that attractive to most prospective customers. The widest range of potential customers will be those who haven’t been convinced yet, but might be open to hearing your message. Generously producing informative, entertaining and/or useful content will likely inspire more people to opt-in to your marketing and will set you on the path to earning the right to promote. If you are purely promotional, you are not likely to attract many people and those you do attract will have no allegiance to your brand and will instead just be looking for a bargain. All my talk about being generous with the content you produce does not mean I am naive about the ultimate goal of marketing. At the end of the day your marketing has to really do one thing and one thing only. Bottom line, marketing has to make more money than it takes to produce. With that being said, many marketers are practicing a kind of marketing that seriously misunderstands the type of appeals that actually translate into revenue and accumulated brand equity. Just asking a potential customer to “please buy our product, because it’s great and you’ll love it” will squander all but your best prospects and might even annoy people who previously liked your brand. As I mentioned earlier, you have to earn the right to put out a direct appeal to buy, and you are unlikely to have permission to promote until you attract customers with a less “salesy” appeal. The art of creating a great indirect appeal will be the key to effective content marketing. 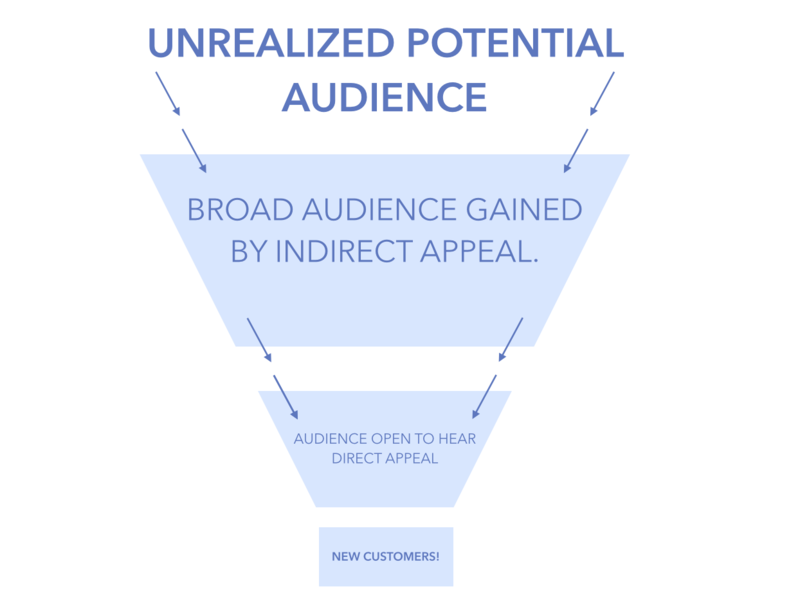 An indirect appeal takes the form of a funnel in which the attractive force is one step removed from the actual outcome you want. Mastering the art of creating a strong indirect appeal and then building content around that promise is no easy task. 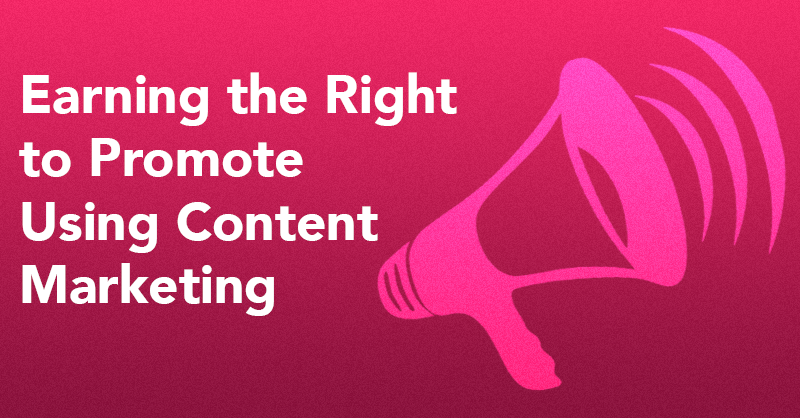 However, you can learn a lot about how to do content right by looking at brands that are successfully earning the right to promote via their content efforts. Contently is a company that pairs great freelance journalists with brands who are looking to foray into the world of publishing. Although Contently builds powerful tools and a seamless experience to facilitate this goal, the key to growing their organization is to push talent through one end of their business and potential clients through the other end. Very much aligning with their core mission they have built a two-pronged content marketing approach consisting of two sister publications. 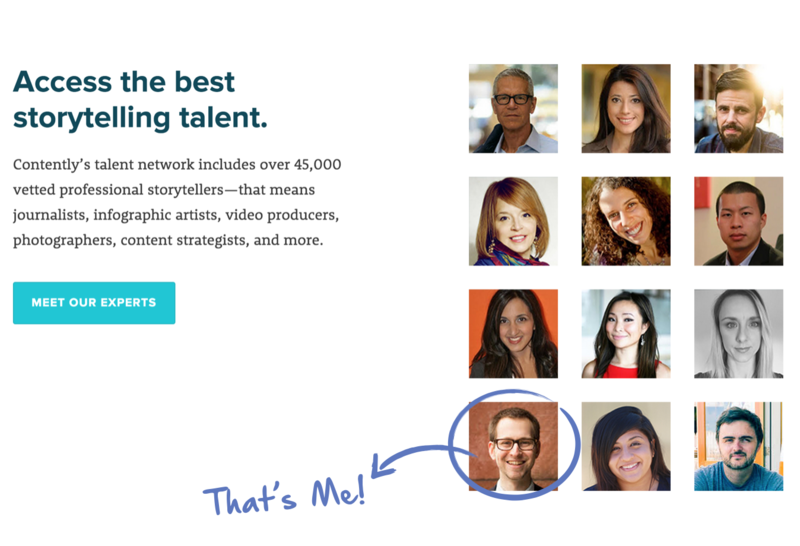 The older and larger of these sites is The Content Strategist, which offers resources more geared towards the potential big-brand clients that might want to hire from their talent pool. The content on this site has the indirect appeal of offering brands unfamiliar with but interested in publishing a resource to help flesh out their understanding of the space and ultimately convince them that they need help from an outside content creator. A freelancer that Contently is happy to put them in touch with. But how do they keep their freelancer talent-pool fresh? That is where their newer content effort The Freelancer comes into play. This resource offers the indirect appeal of offering quality articles and advice about how to optimize a freelance career. Contently has certainly mastered the art of the indirect appeal on both ends of their business. 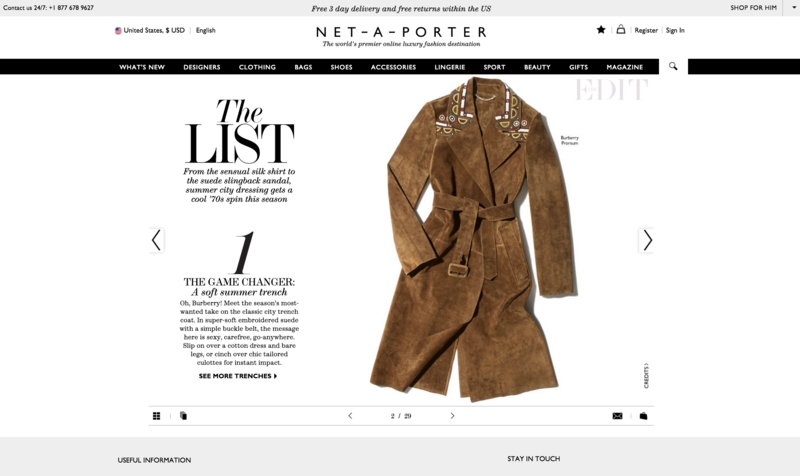 Net-a-Porter is a luxury fashion retailer that doesn’t make their own clothing, rather they collect, curate and editorialize the finest luxury goods. Editorial curation has always been a core value proposition of their brand, but they have decided to take this value proposition one step further by actually creating a magazine of their own instead of simply building an e-commerce store that emulates one. The Edit is an expertly produced mini-magazine that further curates Net-a-Porter’s already handpicked collections and showcases their hottest looks and styles alongside interesting, well written content. Far from being promotional, The Edit is a purely indirect appeal targeted at lovers of fashion-oriented content. The fact that it is hosted on their site and showcases products they offer is simply the hook, not the point. In recent years GoPro’s brand name has become synonymous with an entire genre of online videos. The thrilling, point-of-view style that GoPros seem custom-made for originally came about organically, but as a company GoPro has certainly fostered their growth and have even built a sizable portion of their marketing strategy around this user content. 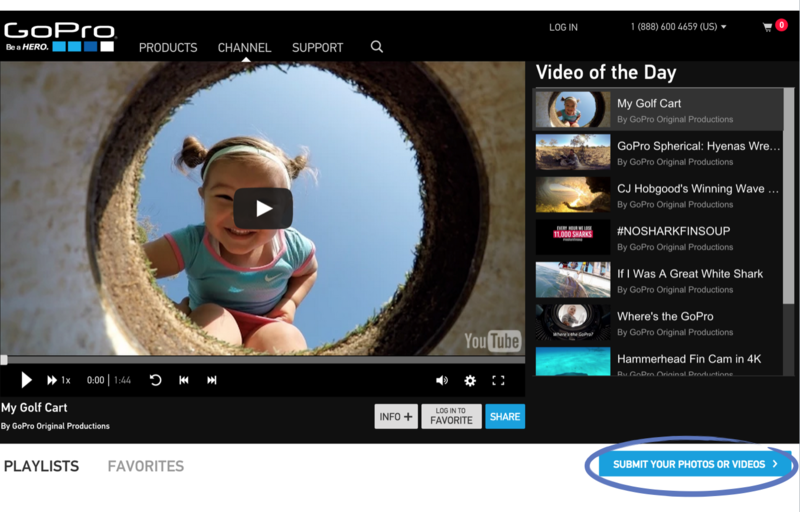 Instead of trying to push their own professionally produced content in order to promote their products, GoPro has embraced this user generated content and has granted explicit permission for novices and professionals alike to publish their own GoPro content directly to their site. GoPro even goes one step further by promoting this user-generated content right alongside their own professional promotional materials. Giving users explicit permission to create and share their own content, as well as explore the content of other GoPro fans creates an environment that inspires a feeling of belonging and is likely to make users much more open to promotional messages down the line. The key to building out a content marketing strategy that will capture user’s attention, prompt them to opt in and eventually earn your brand the right to promote is to understand the value your brand can deliver beyond the tangible elements of your product or service. Content marketing is all about making useful and/or valuable things and leveraging the goodwill generated by that content to inspire action in your audience. Content marketing is NOT about writing articles, making videos or posting photos to Instagram that are purely promotional. A typical TV ad is technically “content” and technically “marketing” but it is in no way content marketing. Just look at the examples above to see what I am talking about. Most of the content here contains no promotion in and of itself, it only opens the lines of communication that would invite a user to opt-in to receive promotional messages. If I were to bet on it, I would assume that most of the time these content efforts close the sale without ever needing to explicitly promote their product. They bring value to the table and implicitly sell the customer without ever actually asking for their business. Earning the right to promote is sometimes all it takes to make a sale. You never exercise the right you’ve earned. NPR receives donations year-round, not just on the day of the pledge drive. Take a long look at your content marketing and even your social media and count the number of posts where there is no direct attempt to promote. Are you just posting advertisements? If so, you are not earning the right to promote. You’re just shouting a message nobody wants to hear into the void. Content marketing that earns permission will be overwhelmingly non-promotional, it will have a strong indirect appeal that plays to your brand’s strengths and expertise yet does not explicitly push your product or service and it will consistently deliver value. In addition, the audience that you push this content to will have opted in to receive it and will only stick around if said content is anticipated and relevant. Last but not least, your content will only earn you the right to promote once your audience decides you’ve earned it. There is no one answer to the question how long will it take, but being consistent, generous and relevant will all but guarantee that your audience will be open to being sold to. Like most everything in business, the right to promote is not something owed to you simply for existing, it is something you need to work hard to earn.